Mrs. Chang Helen came from Taiwan, She has joined with the company in Nepal since 2013. She is well trained, experience staff for the company. 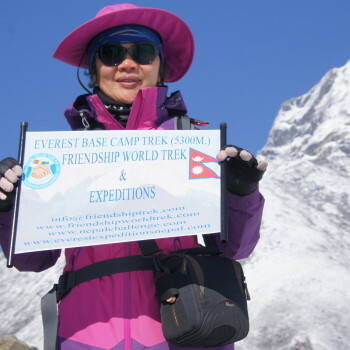 She has more than 10 years experience in this trekking and tours field. She plays a vital role to run an office for the Trekking. She is working as Overseas Marketing officer and Tour Guide for the company. She always thinks a good service and service to the clients. It is our pleasure to have a Chang Helen for the Company. 20 DAYS EVEREST HIGH PASS TREK EVEREST, GOKYO, CHO – LA (PASS) AND KALA PATTAR TREK. The Nepal Himalayas are best seen on this trek as one traces the main route through the Khumbu region from the Sherpa town of Namche Bazaar. The trekkers get a close view of the world’s greatest mountains, Everest and others. Also, we visit the famous Gokyo Lakes and cross the Cho -la Pass (5040 m). C. Ethnic villages & tribes:Mostly Sherpas & Tibetans in villages like Namche, Thyangboche, Periche, Lobuche, Lukla, etc. with monasteries, chortens and Mani stones. Day 16: Arey rest day.